A xenon atom. 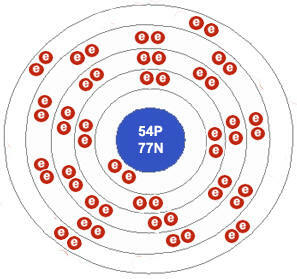 Notice that the outer electron shell has 8 electrons and is therefore full. This makes xenon extremely unreactive. Credit: The Open Door Website. Xenon is normally a colorless gas, but it emits a blue glow when excited by an electrical discharge. Xenon (Xe) is a colorless, odorless, highly unreactive gaseous element, atomic number 54. It is a member of the noble gas family. Xenon is found in minute quantities (about one part in 20 million) in Earth's atmosphere and about half a ton a year is extracted commercially from the fractionation of liquefied air. It is used in stroboscopic, bactericidal, and flash lights and in lasers. Xenon has nine stable isotopes of which the most common is 132Xe. Xenon-133 is a radioactive isotope with a half-life of about 5 days that is used in ventilation scanning of the lungs in nuclear medicine. It gives off beta particle, which are responsible which are responsible for the relatively high radiation dose compared to krypton-81m. Xenon forms a small number of covalent compounds with fluorine and oxygen, showing oxidation numbers +2, +4, +6, and +8. They are reactive and highly oxidizing, and are unstable in acid solution. Most of the crystalline xenate (VIII) salts (XeO64-) are stable. 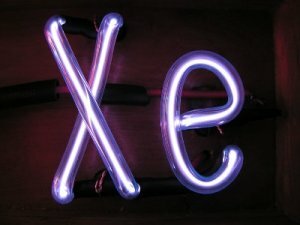 Xenon was discovered in 1898 by William Ramsay and his assistant, Morris William Travers, shortly after they had identified neon and krypton. For many years it was believed that the noble gases – helium, neon, argon, xenon, krypton, and radon – would not form any compounds because their outer electron shells were already full. However, in 1963 Neil Bartlett discovered that xenon would react to form colorful crystalline compounds. An extension of chemical bonding theory has shown how the formation of such compounds does not violate any chemical law and since 1963 a large number of compounds of xenon such as that shown here, and krypton have been made in laboratories throughout the world.